Woodlawn Hospital President John Alley, left, presents a donation to Board President Adam Heckaman. 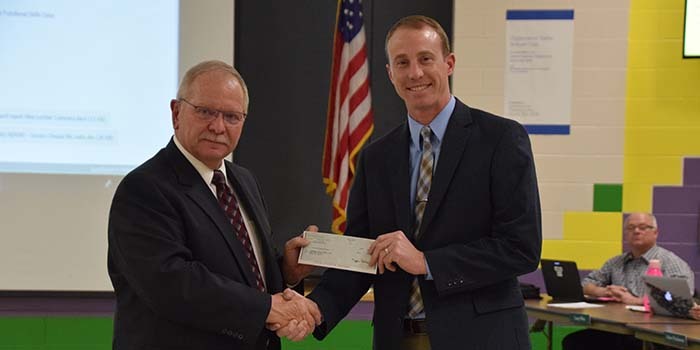 AKRON — During the Tippecanoe Valley School Board meeting held last night, Feb. 18, the board accepted two separate donations for school bus stop-arm cameras. Woodlawn Hospital donated $10,000 and Pike Lumber Company donated $3,800 in support of school bus stop-arm cameras. Before the donation, the school already had five cameras. It was noted that the cameras are being added to the routes with the most traffic as more funds are received. The school continues to accept donations and funding until all school buses in the corporation have stop-arm cameras. A Farmall C tractor donated by William Hoober for the FFA to work on in class. The goal is to restore the tractor and raffle it off. Cooking class supplies donated by Creation Celebration so that students taking functional life skills classes can learn how to safely use all items in a standard kitchen. Twelve swimming life vests were donated via a Donors Choose campaign. A few changes were approved to the school’s master schedule due to recent weather cancelations. Parent-teacher conferences have been moved to March 21. March 22 will now be a student day, previously it was scheduled as a teacher work day. This will bring the last student day of the school year to Friday, May 24. The board heard a presentation from Tammy Stackhouse on Magical Meadows, which provides therapeutic horseback riding. Rick Shepherd was introduced as the corporation’s new school resource officer. Kyler Kearby received the World Class Teacher Award and Maria “Lupe” Quintana received the Pillar Award for Outstanding Support Staff. The board approved hiring Guadalupe Hernandez as an instructional assistant at Akron Elementary. The board accepted resignations for Jordan Lewis, an instructional assistant at Akron Elementary; Penny Shewman, an instructional assistant at Mentone Elementary; Joan Redding, a special needs health aide at Mentone Elementary; Dakota Snapp, a custodian at Mentone Elementary; and Maria Gomez, a custodian at Tippecanoe Valley High School. The board will hold a public work session at 6 p.m. March 14 at the administration office and the next regular meeting will be held at 6 p.m. March 18 at the Tippecanoe Valley High School. 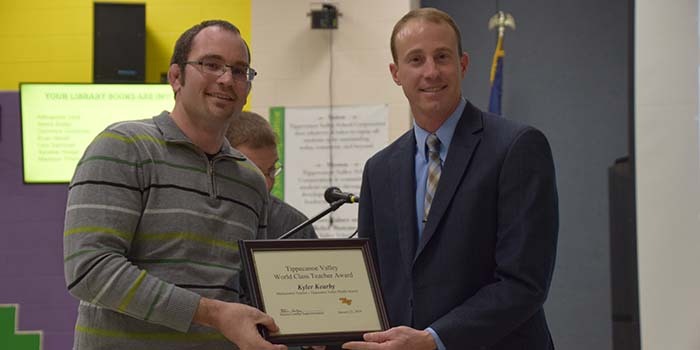 Kyler Kearby, left, was presented with the World Class Teacher Award by Board President Adam Heckaman. 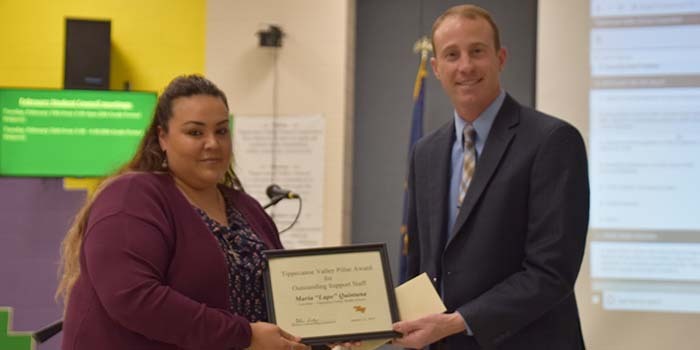 Maria “Lupe” Quintana, left, was presented with the Pillar Award for Outstanding Support Staff by Board President Adam Heckaman.